As I have stated before (if anyone actually reads these things) I love photographing couples. I am always happy when two people in love choose me to document an occasion or moment in time for them. Jan and Peter’s actual wedding was a couple days away, but they wanted to get the wedding photographs taken early. 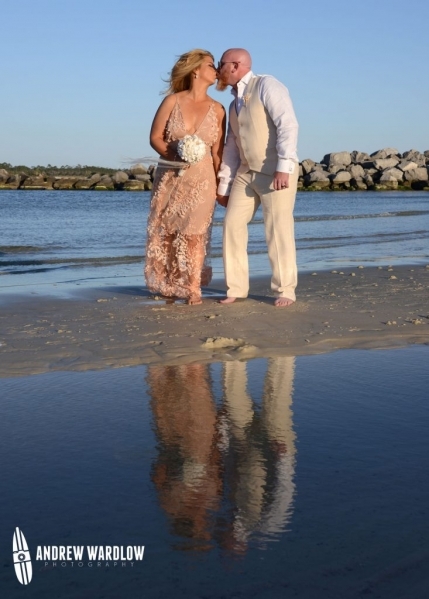 We chose St. Andrews State Park in Panama City Beach for our photo session and lucked out with perfect weather. The wind could have been calmer, but it was otherwise an outstanding day for beach wedding photos. The tide was really low at our session and this gave us a couple opportunities that are not always available. For starters, a little island had formed at the kiddie pool at St. Andrews. I knew we could get a nice refection of the love birds so we proceeded to figure out the best spot for them to stand and got a nice handful of reflection photos. As we moved along toward the jetty area, I noticed that there were some exposed rocks that had a beautiful green mossy substance growing on them. (Sorry I do not know the scientific term for it) This area is typically underwater, but the low tide gave us a chance to utilize this spot for a few photographs. My favorite photos from the day came from this spot. As the sun drew closer to the horizon, we made our way to the Gulf of Mexico for the remainder of our session. We did a bunch of photos with the sunset and then it was time to call it a night. Jan and Peter both photograph well and it was a pleasure to document this time in life for them. Best of luck to you two!